Girl's lacrosse is a game played by 12 players at a time, 11 field players and 1 goalkeeper. The objective of the goal is to shoot the ball into the net of the opposing team. Whichever team scores the most goals in the game wins. The game begins with a draw at center field, and a new draw occurs after every goal. The draw is taken by one player from each team, and two other players from each team are allowed to stand between the two restraining lines (usually the 30 yard-lines) for each draw. During gameplay, field players can either pass or run with the ball in the pocket of their stick. Seven attacking players are allowed over the offensive restraining line, and seven defensive players plus the goalkeeper are allowed over the defensive restraining line. This means there are 4 players from each team that have to remain behind the restraining line at all times. Players can exchange over the restraining line as long as the player switching has both feet over the restraining line before their teammate enters the offensive/defensive ends. Any "checks", which is when a player uses their stick to hit another player's stick, is deemed a foul if it is dangerous or towards the body. Other fouls include pushes and dangerous contact. Fouls can be categorized as major, minor, team, goal circle, and misconduct fouls. Fouls that occur within the 8-Meter Arc result in a free-position. Whenever a player fouls on the field, they must go 4 meters behind the player they committed the foul on. The field is divided into three parts by the two restraining lines. The 8-meter arc: an area in front of the goal (there are two, one on each side of the field). Fouls inside the 8-meter result in a free-position. On a free position, everyone has to be outside of the 8-meter arc, even the girl with the ball. A defender cannot stay in the 8-meter for more than three seconds if they are not marking an attacker. The 12-meter fan: an area in front of the goal, four meters around the 8 meter-arc and 12 meters from the goal circle. The center circle: a large circle found in the center of the field. The draw is taken in the center of the field inside the circle. U9 and U11 youth teams play on a modified field with 7 players (6 field and 1 goalkeeper). The field is divided in half and only 4 players are allowed over the midfield line. No checking is allowed and Net Nannies are often used at the U9 level in place of a goalie. G12 and G34 play on a modified field consists of 2 attack, 2 midfield, 2 defense and 1 goalkeeper. G34, G56 and G78 play on a full field consists of 4 attack, 3 midfield, 4 defense and 1 goalkeeper. Boys lacrosse is a game played between two teams of ten players. Each team tries to outscore the other team by shooting the ball into the goal of the opposing team. Whichever team scores the most goals wins. There are 10 players on each team. Four of the players must stay on the defensive half of the field, three must stay on the offensive half, and three can go anywhere on the field. The game is divided up into two halves and 4 quarters with each quarter being 12 minutes long. College lacrosse games are longer and kids’ games are shorter. The game begins with a face-off between two players at mid-field. The ball sits on the ground between the two players and the referee blows the whistle. This signals the opposing players to go after the ball. A face-off will also occur after each goal and at the start of each quarter. During gameplay, players can either pass or run with the ball in the pocket of their lacrosse stick. Only the goalie can touch the ball with their hands. All other players must use the lacrosse stick to carry, pass, shoot, or catch the ball. When an opponent has the ball or is within five yards of the ball, a player can body check them. A body check is contact from the front between the waist and the shoulders. You can also stick check the player on the stick or gloves to try and knock the ball away or to keep a player from getting the ball. When a player with the ball or the ball goes out of the field of play, the opposing team gets the ball unless the ball goes out of bounds after a shot. In that case, the team with the player closest to the ball when it went out of bounds gets the ball. The field is divided into 2 halves by a midfield line and each team defends a goal. 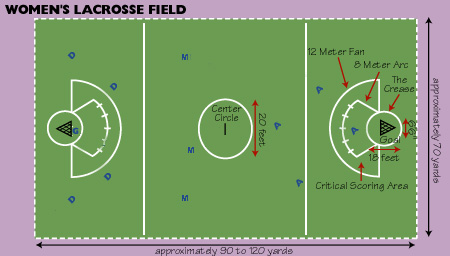 The standard lacrosse field for high school and college field is 110 yards long and can be from 53 1/3 to 60 yards wide. The goals are 80 yards apart with a playing area of 15 yards behind each goal. The length of the field is divided in half by a center/mid-field line. The field is shorter for youth lacrosse. There is an area around each goal is called a crease. An opponent is not allowed to enter the crease, but they can reach in with their stick to pick up the ball. Each team plays 10 players at a time consisting of 3 attack, 3 midfielders, 3 defense, and 1 goalie. Typically, the attack stays on the offensive half and attacks the opposing team’s goal, while the defense stays on the defensive half and defends their goal. Midfielders can go anywhere on the field. Players are allowed to exchange across the mid-field line, so long as four players remain on the defensive half of the field and three stay on the offensive half at all times. Some plays that are not allowed in lacrosse are called fouls. If a player commits a foul, they will get go to the penalty box for a time period ranging from 30 seconds to 3 minutes. Like hockey, the team with a player in the penalty box will have to play man-down during the penalty. Lacrosse personal fouls include tripping, unnecessary roughness, cross checking (making contact with another player with the stick between your hands), slashing (a stick check not on the opponents gloves or stick), or illegal body checking. Some lacrosse technical fouls include holding, off-sides (not the right number of players on each half of the field), setting moving picks, stalling, and pushing.